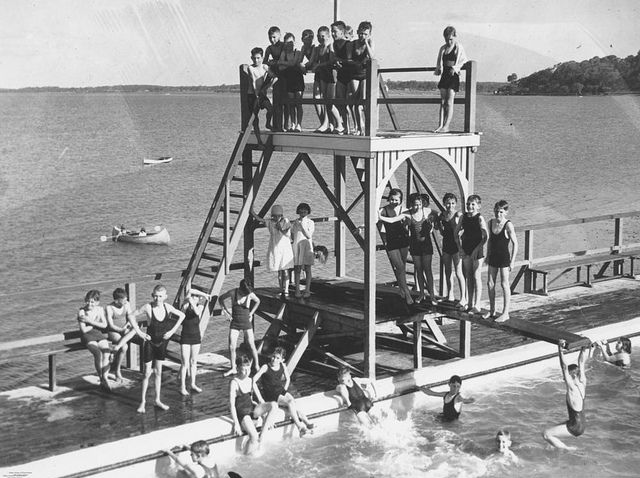 Friday flashback to vintage Brisbane of 1936 and the popular Manly Swimming Baths. This picture shows swimmers using the diving tower and springboard in the centre of the pool. Long wooden benches are arranged along the pool's edge for seating. The swimming baths were filled by pumping salt water from high tide at least once a week (description supplied with photograph). Keep up to date with Brisbane thru the eyes of Lady Brisbane. Lady Brisbane respects your privacy. Your details will only ever be used to keep you updated with Brisbane news.